September 17, 2004 Vancouver, B. C. Canada – Canada has reported crop formations since the mid-1990s all over the provinces ­ but the region that has always had the most patterns for whatever reason has been Saskatchewan. Until 2004. Currently, Paul Anderson, Director of the Canadian Crop Circle Research Network – known as CCCRN – has a total of twelve crop formations reported in eleven sites, starting on on May 26, 2004, at Nahanni Butte, Northwest Territories. Left to right: Three confirmed crop formations in British Columbia (fourth “Ankh” described but not found); two huge tree circles in Northwest Territories; two in Alberta; one in Saskatchewan; three in Ontario; and one in New Brunswick. Map © 2004 by Paul Anderson, CCCRN. There, two circles were discovered in tall poplar trees. Paul reports that one tree circle was 300 feet in diameter with all trees snapped off and flattened radially inward with the tops pointing toward the center. This tree circle was half a mile from a second, larger one. estimated to be 500 feet in diameter! All those trees were also snapped off and flattened radially inward with their tops pointing toward the center. Even though these large tree circles were discovered on May 26, Paul did not receive reports about them until August. When photographs are available, I’ll report about them with Paul at Earthfiles.com. From May to September, in addition to the two tree circles in the Northwest Territories, there were four crop formations reported in three British Columbia locations, two in Alberta, three in Ontario, one in New Brunswick, and finally one in Saskatchewan reported on September 2nd. This latest pattern is three ovals in mixed wheat and pasture grass in Wadena, Saskatchewan – the same farming community that had an odd pattern of four ovals in barley last year, reported on August 19, 2003. Above: Wadena, Saskatchewan, four ovals in barley over a distance of 284 feet, reported August 19, 2003. Diagram © 2004 by Paul Anderson, CCCRN. Below: Map of Wadena east of Saskatoon. These latest ovals in Wadena are east of Saskatoon, Saskatchewan. When I went to the map I have been using the past decade for Canadian crop formations, the concentration of yellow marks in Saskatchewan along a southeast to northwest corridor stands out and Wadena is part of that crowded pattern. 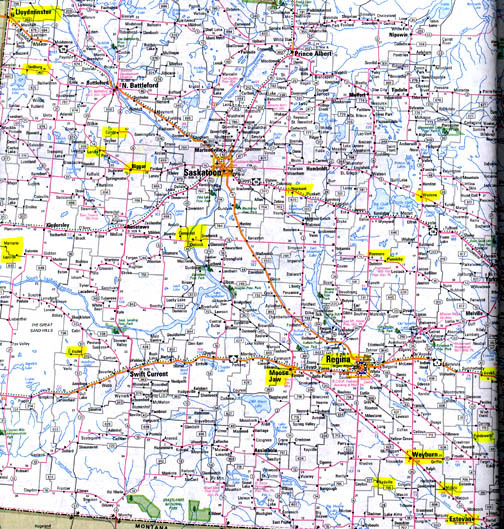 From Estevan in the far southeast corner of Saskatchewan to the northwest at Lloydminster, there have been crop formations in the yellow-colored sites shown on the map. As in the 2004 Hillsboro and Miamisburg, Ohio, corn formations in the United States, scientists have been surprised by the number of plant and soil anomalies found this year ­ and Canada is adding to the anomalies. I talked with Paul Anderson about the latest circles in Wadena, Saskatchewan, as well as a very unusual ring found near Calgary the end of August; and a pattern never seen before in Canada in a place called Matsqui, ­ not far from Vancouver ­ where Paul found many unusual expulsion cavities shaped like triangles and diamonds in the growth nodes of tall cattle corn. We’ll begin with the latest September 2nd pattern of three circles in Wadena which covered a distance of about 73 feet. The mixed wheat and pasture grass had been laid down so gently that delicate dirt earthworm mounds right beneath the crops were not disturbed. Paul also discovered that even though the circles looked geometric, there was something odd about their centers. Wadena, Saskatchewan, three ovals in mixed wheat and pasture grass over a distance of about 73 feet, reported on September 2, 2004. Diagram © 2004 by Paul Anderson, CCCRN. Photo below © 2004 by Larry Hahn. I was researching Indus astronomy symbols and came across this graphic which reminded me of the Wadena, Saskatchewan, crop ovals of 2003 and 2004. Perhaps symbol designating pole star? Source is Ancestry.com. “IS THE WADENA 2004 PATTERN IN CIRCLES OR OVALS? All three are slightly elliptical and I should note, too, that the center of each one is off center, which is of course is another feature that has been noted over and over again in formations like this over the years. YES, IT’S A PUZZLE TO THE GEOMETRY PEOPLE ­ WHY SHOULD THERE BE NON-GEOMETRICAL CENTERS TO PATTERNS THAT OTHERWISE SEEM GEOMETRICAL? Yes. And it’s also been taken as a sign to probably indicate genuineness, because if you manually create a circle just using boards, rope and what have you ­ in most cases you’ll get something like a perfect circle with the center pretty much dead center. And yet we find a lot like this one where the center is sometimes way off center ­ sometimes several feet from the actual geometric center of the circle or oval. Often times there is also a beautiful tight lay of the crop which we have again in this case. One of our CCCRN Saskatchewan researchers, Beata Van Berkom, found small earthworm mounds in the soil just beneath the flattened crop. They did not appear to be disturbed at all. The ground was quite dry, drier inside the formation than outside of it, she reported. The small little worm clumps are delicate ­ if you touch them, they will fall apart quite easily. But they appeared to still be intact beneath the flattened plants. 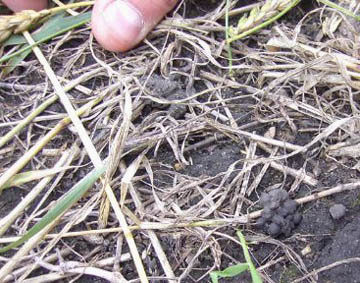 One of the small, undisturbed earthworm diggings (“dirt balls”) found beneath the flattened wheat and pasture grass inside one of the three Wadena, Saskatchewan ovals reported September 2, 2004. Photograph © Beata Van Berkom, CCCRN Saskatchewan. The one in Calgary was reported August 26. This was different and unusual in that it was found in pasture grass in a large nature park just on the outskirts of town. We’ve had ones like this before and ones in pasture grass have been fairly common in this country. But this one is a single ring. Again, it’s an oval, not a true circle. But the ring itself is only about 12 to 18 inches wide. 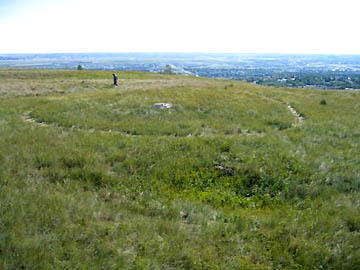 Forty-foot-diameter oval in pasture grass surrounding a natural white rock on hill above Calgary, Alberta, Canada, reported August 26, 2004. Width of ring was about eighteen inches. Photograph © Cielia Kaufman, CCCRN Alberta. What was interesting about it is that the ring was centered around a large, white rock which was just sitting in the field. The rock itself appeared to be part of the landscape. It didn’t look like someone had placed it there. The rock ended up being almost dead center in the ring. 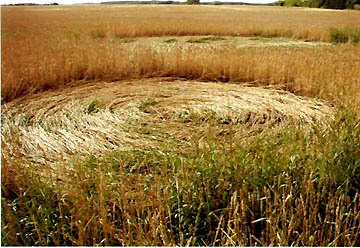 The 1.5-foot-wide ring was made up of grass flattened in all different directions. Some of the lay was actually going straight across the width of the ring, so it was not a simple case of some one walking around in a ring and just flattening down the crop with your feet or something. 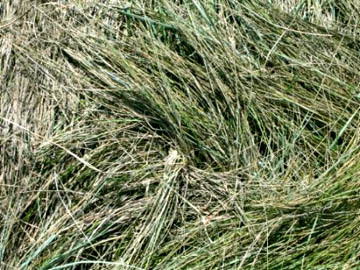 You have the lay of the grass which is at all different directions, going on top of each other in two or three layers sometimes. 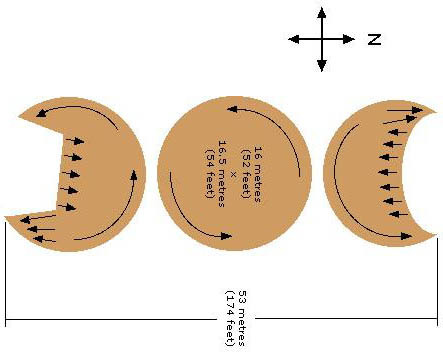 Above: There seems to be a rhythm to the way the pasture grass was laid down in the ring, even if the grass was laid in different directions, as shown in the close-up below. Photograph © 2004 by © Cielia Kaufman, CCCRN Alberta. 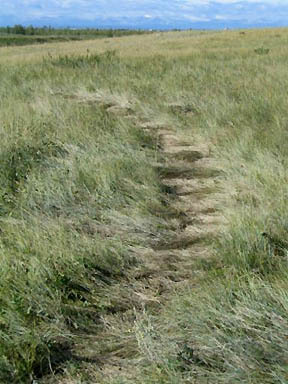 Close-up pasture grass laid down in different directions inside the Calgary ring pattern. Photograph © 2004 by © Cielia Kaufman, CCCRN Alberta. AS WE HAVE FOUND IN VARIOUS PATTERNS AROUND THE WORLD, WERE THERE ANY INDICATIONS THAT PLANTS BELOW THE SURFACE MIGHT BE GOING 180 DEGREES OR 90 DEGREES TO THE SURFACE PLANTS? In some cases, yes, where you had plants going different directions overlapping ­ it would be at approximately 90 degrees in some cases. You would have a flow of plants flattened going in one direction and then you’ll have another bunch on top of that going as much as 90 degrees to that. That’s what I meant by opposing directions, but it was all mixed in all different parts of the ring. Matsqui is between Abbotsford and Mission where large crop formations in tall cattle corn have been reported in previous years. See: 10-01-02 Earthfiles; 10-03-02 Earthfiles; 10-11-02 Earthfiles; and 08-23-03 Earthfiles. Map by MapQuest. I’M VERY CURIOUS ABOUT THE ALLEGED EGYPTIAN ANKH SYMBOL THAT WAS REPORTED IN CATTLE CORN IN EARLY AUGUST NEAR MASTSQUI. 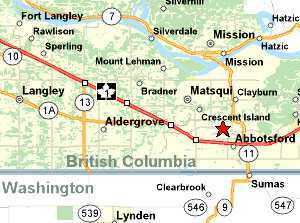 Matsqui (MAT-skwee), is like a smaller subdivision of the town of Abbotsford, where the large formation was found last summer (2003), also in cattle corn. 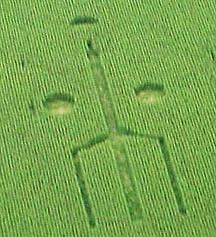 Abbotsford, British Columbia, Canada, approximately 300-foot-long pictogram in very tall cattle corn (9-10 feet), reported on August 13, 2003. Aerial photograph © 2003 by Mike Black. As you know, this area here in the Fraser Valley just east of Vancouver, B. C., about 50 to 60 miles or so, has become some what of a hot spot. All the formations in this area have been in the same type of cattle corn, which is different from the sweet corn which we also have around here. But interestingly, for whatever reasons, all the formations so far have been in this taller cattle corn. 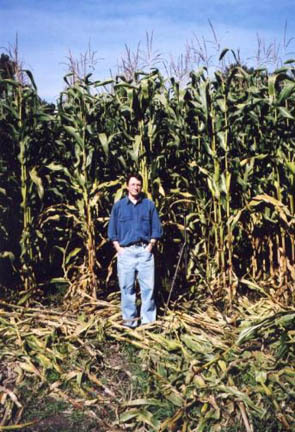 Paul Anderson, Director, CCCRN, standing in the Abbotsford, British Columbia, Canada, 9 – 10 feet tall cattle corn formation reported August 13, 2003. Photograph © 2003 by CCCRN. These two formations in Matsqui were located only two or three miles or so from the location of the big one in Abbotsford last summer. Both of the new ones were seen at the same time by a woman who had gone skydiving in early August (exact date not known) and as the plane was ascending, she noticed one pattern that looked to her like an ancient Egyptian ankh symbol. 18th Dynasty ankh, symbol of eternal life force, from the reign of Amenhotep II made of wood. Image from TourEgypt. Paul Anderson: “Then just a few moments after that, the skydiver spotted the second crop formation which is a circle with two crescents, one crescent on either side of the circle. So far, we have found the crescents formation, but we are still looking to find the Egyptian ankh symbol. We know the approximate location where it has to be based on where she took off in a plane and where this crescent one is ­ because the other has to be in between somewhere. 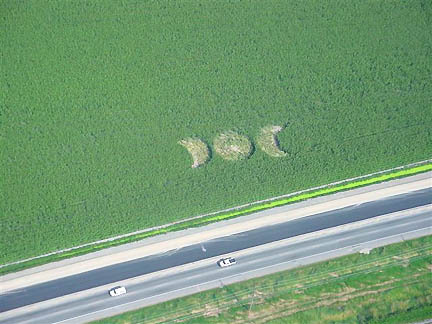 Matsqui, British Columbia, Canada, circle and two crescents in tall cattle corn covering 174 feet (53 meters), reported in early August 2004 by skydiver who saw this pattern and a second, nearby “ankh” pattern from ascending airplane. Aerial photograph © 2004 by Anne Nadeau. Diagram of Matsqui, British Columbia, Canada early August 2004 pattern in tall cattle corn © 2004 by Paul Anderson, CCCRN.